Apart from heating the cream and allowing time for the lemon zest to perfume it, this dessert can be assembled in about 4 minutes, provided you have a food processor. The light, fluffy topping will work with lots of fruity combinations; apple and blackberry or raspberries, blackcurrants, redcurrants (or dried fruits in winter), rhubarb and strawberry with orange zest, apricots, plums, pears, etc. Some fruit needs more sugar than others so reduce or increase the amount used in the fruit (and sprinkled over the topping) – to taste. Serve with cream, vanilla ice cream or my personal favorite especially in winter, English custard (aka Creme Anglaise). In a small pan bring the cream to a boil, immediately turn off the heat and add the lemon zest. Set it aside to cool and once cool, strain and discard the zest. Preheat the oven to 425F (220C). Wash and chop (if necessary) the fruit, toss it in the sugar and pile it into a buttered baking dish about 8-9 ins across by 2-3 ins deep (23 x 6 cm). In a food processor, combine the flour, baking powder, a pinch of salt and diced butter. Pulse until it resembles fine breadcrumbs then tip in the cooled cream (lemon zest removed). Pulse again until you have a thick, sticky paste. Scoop out the dough in large spoonfuls and plonk it on top of the fruit. Sprinkle the topping liberally with sugar (demerara sugar, cinnamon sugar, vanilla sugar – they’re all good). Bake in the upper part of the oven for about 30 minutes or until the topping is a bit puffed and a lovely golden color. Will there be too much liquid with the fruit? Do you just cut the fruit and put it in without adding anything? The sugar encourages the natural juices out of the fruit. No need to add water. Oh my goodness – it was delicious! 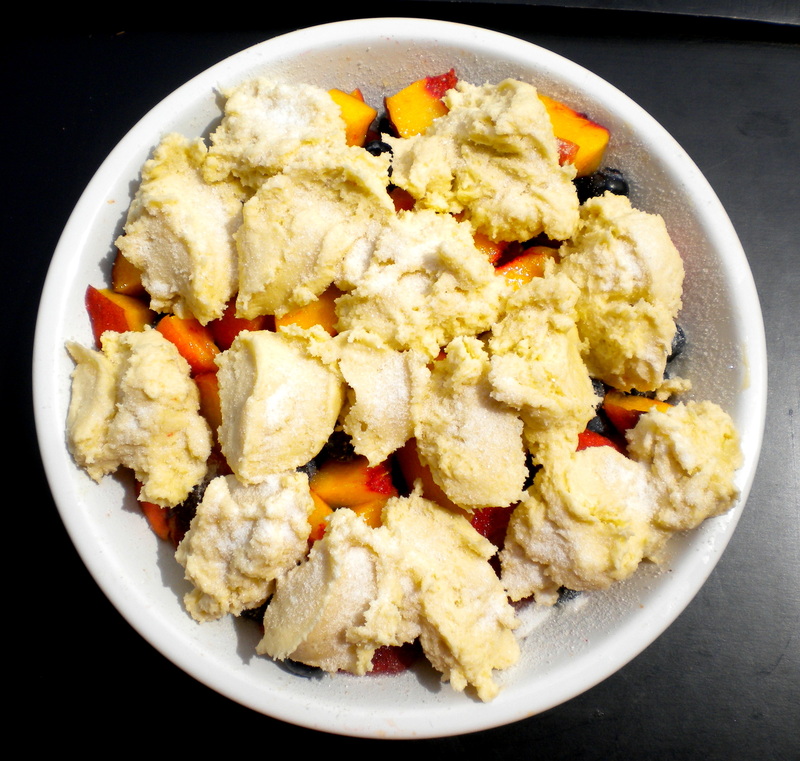 The combination of the peaches and blueberries was especially good. It was a very nice change from a fruit crumble and VERY easy to make. Definitely on our favourites list from now on!